KIEV, Ukraine -- There has been a surge in attempts to smuggle illegal weapons into the European Union amid the conflict in east Ukraine, according to figures from Polish border guards. 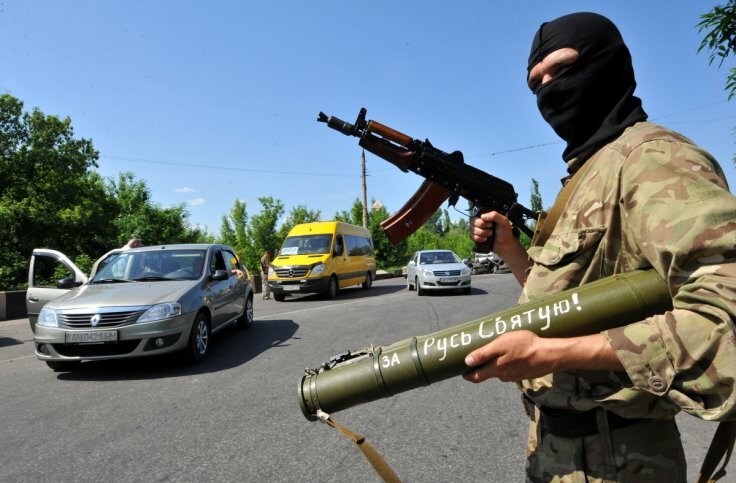 Pro-Russian militant at a checkpoint near Kramatorsk. Poland has been forced to introduce increased security measures, with criminals increasingly attempting to exploit trafficking routes across across the Ukrainian-Polish border and transport weapons into the heart of the European Union, where they can fetch as much as $2,000 (€1,800). Arms smuggling rates from Ukraine to Poland are at their highest rate since 2012, when Polish border security was increased for the European Championship football tournament hosted jointly with Ukraine, and officials seized 57 firearms and 3,457 pieces of ammunition. The number of firearms confiscated the previous year was 25, before dipping again the year after the competition. There is increasing concern about the increasing availability of weapons fuelling terrorism and organised crime in Europe. Islamist terrorists armed with illegally acquired weapons have committed two terror attacks in Paris in the space of a year, and security services across the continent are battling to prevent further attacks by groups of roving gunmen. Violence in east Ukraine between government forces and pro-Moscow militias has been sporadic since September. Under the terms of the recent Minsk ceasefire agreement, officials from the European Council for Security and Co-operation in Europe have begun overseeing the withdrawal of heavy weapons from the front line in Donetsk and Donbass. Lucrative western Europe is the market many criminals will be seeking to exploit, he added. "This is a depressing inevitability. This is the natural dynamic of the illegal arms market". "A lot [of diplomatic effort] is about resolving the situation in Ukraine, and a lot of the discussion has involved heavy weapons and the withdrawal of armoured vehicles and so forth from the front line," he said. "But there has been very little talk of the control of small arms and light weapons. I would recommend putting that on the agenda of talks as a matter of greater urgency." Kalashnikovs sold in west European cities – such as illegal weapons hub Brussels – can fetch up to $2,000, a more than 200% increase on the $500 they will reportedly fetch in Donetsk in east Ukraine. Often they are transported into Europe by individual operators one piece at a time, in a racket dubbed the Ant Trade by experts. Ukraine has long played a key role in the global weapons trade. In 2014, the Washington-based Center for Advanced Defense Studies released the report describing a network of individuals and companies allegedly responsible for shipping weapons to conflict hot spots worldwide from the Black Sea port of Odessa, which it dubbed the 'Odessa Network'. Galeotti continued: "There are such deeply established smuggling routes out of Ukraine, for example for Afghan heroin. The problem is if you have these pipelines already established it means you have corrupted border officials, people who know the ropes. Once weapons are trafficked into the open border Schengen zone, they can easily be transported between member states. The Kalashnikovs, handguns and Scorpion machine gun used in the January 2015 attacks on the Charlie Hebdo magazine and a Kosher supermarket were allegedly bought by terrorist Amedy Coulibaly from an illegal arms trader in Brussels, one of the hubs in the EU trade in illegal firearms. A man recently arrested in Germany is accused of selling the perpetrators of the November Paris attacks their weapons through an illegal website. "Is not yet a major issue in the EU, but it has to be seen to be a potential one. "They [weapons] will undoubtedly be trafficked into Europe, and they are leaking [onto the black market], as shown by various incidents," he said. EU interior ministers recently met to discuss measures to combat the trade in decommissioned weapons in Europe, but experts have warned that more needs to be done. Though the European Commission recently advocated centralising border checks for the wave of refugees and migrants entering the EU, no co-ordinated measures have been proposed in response to weapons smuggling. With the threat from terror group Islamic State (Isis) the key concern since the Paris attacks and a series of thwarted attacks across Europe, Galeotti warned not to divert resources from the battle against organised crime, which is the real source of the market in illegal weapons. "Actually fighting organised crime and minimising its capacity and will to look for weapons one of the best ways you can hit the market," he said. Ukraine, Grant said, needs to be offered "tangible assistance" to tackle its smuggling networks. "And that would be offered in a variety of ways, it may be financially. They need concrete practical assistance. Too much of the time we in western Europe take the attitude 'we have a people trafficking problem how can you help us? We have a heroin problem, how can you help us?' The question should be 'what can we do for you?"